Hey Otakus & Geeks fans at the New York Comic Con 2017. Image Comics/Skybound Entertainment held a panel at NYCC. 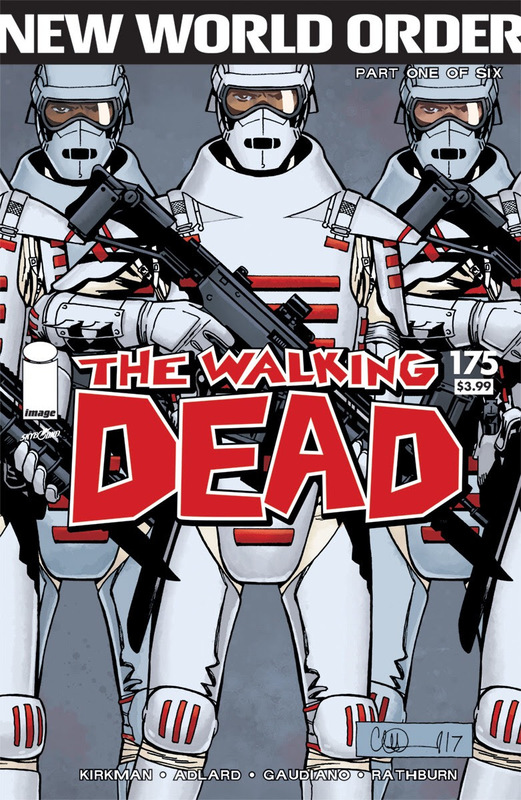 At the panel the new cover for The Walking Dead #175 was revealed. Check out the details and cover below. Based off the title of New World Order it seems things are really going to get even worse for the group. Image Comics/Skybound Entertainment revealed the ominous cover artwork for the forthcoming THE WALKING DEAD #175 by creator/writer Robert Kirkman (OUTCAST BY KIRKMAN & AZACETA, INVINCIBLE) and artist Charlie Adlard. Kirkman took to the stage today for his "Robert Kirkman: The Walking Dead, Invincible, and Beyond" panel and revealed the buzzworthy cover that will be featured on THE WALKING DEAD #175. This reveal followed on the heels of Kirkman’s Wednesday announcement about his new ongoing series co-created with artist Lorenzo De Felici, OBLIVION SONG. This jaw-dropping new story arc of the bestselling THE WALKING DEAD will feature all new friends, all new enemies, all new threats, and will appropriately be called, New World Order. THE WALKING DEAD #175 will take 2018 by storm and hit comic stores on Wednesday, January 3rd.